The reallocation of Route #40-D-Ride’s resources doesn’t mean the end of free service in Downtown Albuquerque. Beginning Saturday, May 12, 2018, there will be a Modified Free Fare Zone in Downtown, seven days a week (unlike the Monday through Friday D-Ride). 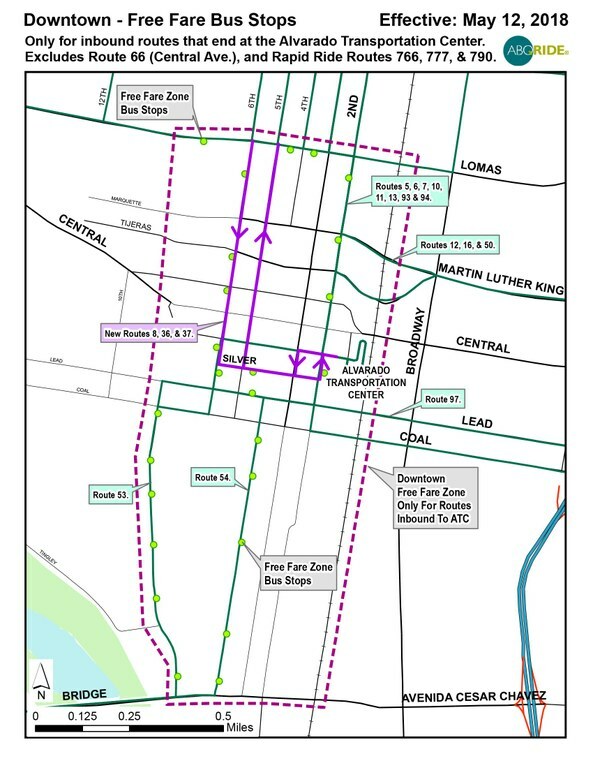 This new Free Fare Zone will increase the number of routes and buses that Downtown residents and employees can use for free for short inbound trips in an expanded Downtown service area. These include inbound Routes #8-Menaul and the #36/37-12th St. /Rio Grande and all other inbound routes to the Alvarado Transportation Center (except for Routes #66, 766, and 777). *This will not affect passengers on the New Mexico Rail Runner Express, who can still connect for free with outbound buses at the Alvarado Transportation Center.